Thief! I kept getting this card combo when dealing with some very slippery. I thought it was metaphorical until the person in question stole my intellectual property, reworked it and published it under his name! Now I have to copyright everything I’ve written that he has in his possession to protect myself — short stories, poems, dreams, my manuscript, visions and ideas I was throwing around. It’s funny because about a month before his book came out, this woman on the bus told me that her dad wrote for the Twilight Zone and you never know who will steal your work so copyright it to protect yourself. I didn’t believe her until this. The unfortunate thing is because it was just my ideas and editing, I can’t do anything about it even though I didn’t give the perpetrator permission to publish these stories. So all I can do now is be proactive. In a way, it’s flattering to be envied to the point of being stolen from but it’s also infuriating because I trusted this person, who had lied about so much that I’m not even sure I knew who he was to begin with. And it’s also insulting because he thinks I’m too stupid to do anything about it. And the worst part is, this is not the first time I had my work stolen! When I was 10, I gave my first novel I was working on to a teacher at a summer camp. She never gave it back, even after I ran into her at a conference. She said she’d send it to me but she never did. So who knows, maybe I’m already published under someone else’s name and I don’t even know it. So now I have to wise up, take action and be prepared. It’s going to be annoying but this is an international matter so I need a proper copyright. Creative Commons may not hold up in court if, heaven forbid, things went that far. I doubt they will, but it’s best to take precautions. All images from the Mucha Tarot. 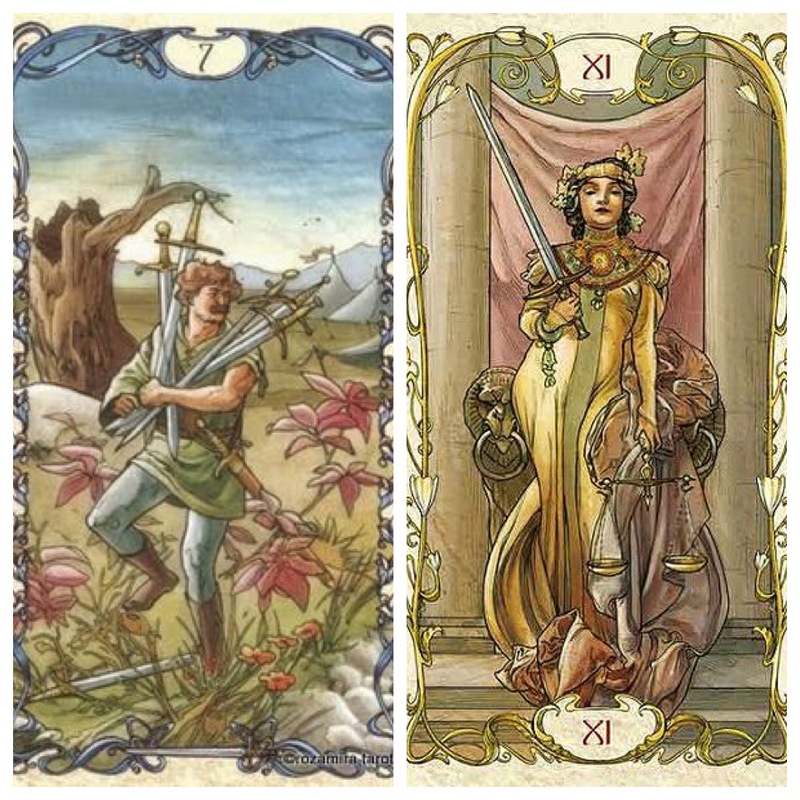 Magdalena Tarot does not claim he rights to any of these images. This entry was posted in Uncategorized and tagged 7 of Swords, astrology, card a day, card combo, divination, empowerment, inspirational, Justice, motivational, Mucha Tarot, numerology, occult, pagan, self help, tarot, witchy. Bookmark the permalink.